What would the City of Lights be without the Eiffel Tower, Notre Dame Cathedral or the Sacré- Cœur Basilica? Download your free PDF map of Paris monuments and discover the most beautiful Paris tourist destinations! 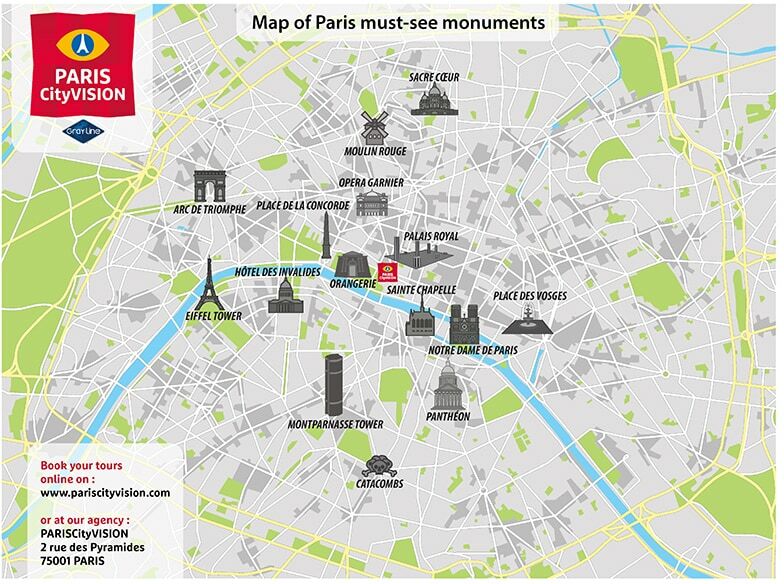 Whether you are staying in Paris for a few hours or for several days, you will find this monument map very useful. Tourist guidebooks, even pocket editions, take up a lot of space in your backpack and weigh you down. What about mobile apps? Although they are more practical, they require a network connection to work properly. Download this map of Paris monuments in PDF format and register it on your smartphone or tablet. You can easily plan your next vacation by organizing a visit to iconic Parisian monuments like the Eiffel Tower, Notre Dame Cathedral or the Arc de Triomphe, located at the end of l’Avenue des Champs Elysées. A map of the famous monuments of Paris…and others! You need a map that identifies the most iconic monuments of Paris. This will enable you to easily find the Eiffel Tower, the Arc de Triomphe, the Sacré-Cœur or Notre Dame, and locate them in relation to each other. But other lesser-known tourist destinations also deserve your attention. Our map invites you to discover remarkable buildings which are less popular with tourists. This allows you to easily organize and plan your own sightseeing tour to include all the Paris monuments you choose, in no time at all. Do you want to be able to slip it into your pocket and add notes? You can also very easily print our map in PDF format.